The number one cause in premature tire wear is incorrect tire pressure. 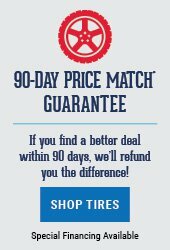 Tire rotation helps maintain an even amount of treadwear. In fact, on that basis some manufacturers actually require periodic rotation as a condition of their warranty. Maintaining uniform treadwear generally prolongs the performance of your tires and reduces the opportunity for wheel vibration along with a number of other issues. What Does 'Alignment' Mean? When your vehicle is 'out-of-alignment', its suspension and steering systems no longer function at their intended angles. Alignment issues typically occur as result of wheel impact on severely damaged roads or by hitting a curb - generally anything that gives your front wheels or suspension a jolt. Alignment issues can also occur as parts wear from high mileage.